The Santa Rita Mountains gave up a secret last Saturday, a secret that stretches back more than 50 years to one of the saddest stories in Arizona history. And it did so in startling fashion. On Nov. 15, 1958, six Boy Scouts from Tucson started out on a day hike from Madera Canyon to Mount Baldy, now known as Mount Wrightson, in the Santa Rita Mountains. The temperature was in the 70s and the forecast called for wind but no chance of rain. On the hike were Louis Burgess, Ronny Sepulveda, Ralph Coltrin Jr., Mike Early, Michael LaNoue and David Greenberg, who was celebrating his 12th birthday. Part way up the mountain, two young Scouts became tired and, with a third, turned back. The others forged ahead. Not long after, everything started to come apart. Unsophisticated weather forecasting methods of the day couldn't predict what was to come. The wind kicked up and, as night fell, rain came. Snow began to fall around midnight. The freak storm dumped 6 inches of snow in Tucson, and on the mountain several feet of snow covered trails and landmarks. After a massive but fruitless search for the lost Scouts by 700 volunteers, a rancher finally found the three bodies east of Josephine Saddle on Dec. 4. Soldiers from Fort Huachuca stacked rocks and erected crosses where the boys were discovered. Then they carried Mike Early, Michael LaNoue and David Greenberg off the mountain. In August 1959, Ralph Coltrin Jr., who was just 12 on the day of the hike, returned to the site with John Early, Mike's father. They carried three small markers fashioned by a Southern Pacific Railroad metalworker. They found the three stone piles and wooden crosses and wired the metal markers with each boy's name to the memorials. Thirty years later, in 1988, Coltrin returned and found two of the markers deteriorating. The third, Michael LaNoue's, was missing. He decided to take the markers off the mountain. Greenberg's went to his family, but by then the Early family was gone and the metal marker was placed in the Otis H. Chidester Scout Museum in Tucson. In 2010, Coltrin's sister, Cathy Hufault of Vail, wrote a book to commemorate the 50th anniversary of the deaths. "Death Clouds on Mt. Baldy: Tucson's Lost Tragedy" sparked renewed interest about the event in the mountains overlooking Green Valley and Sahuarita..
And that's where Scott Gallas comes into the picture. Gallas heard Hufault speak at the Green Valley library and read her book. She mentioned that the third marker had been lost for decades, and that her brother still led hiking groups up the mountain to the site. Last Saturday, Gallas, 54, and his son, Scotty Jr., 23, headed up the mountain. They got up to Josephine Saddle where there's a memorial to the boys. "I took a quarter out of my pocket and stuck it on the memorial and we just kept going," Gallas said. Then, he said, things got odd. "It was like somebody poked me in the back. I got goose bumps. I told my son, 'We have to find where those boys were.' In (Hufault's) book there's a map that marks the death site, and so I followed the map." The two left Temporal Gulch Trail just after McBeth Spring and found piles of rocks that looked like they'd been stacked. That's when the mountain gave up its secret. 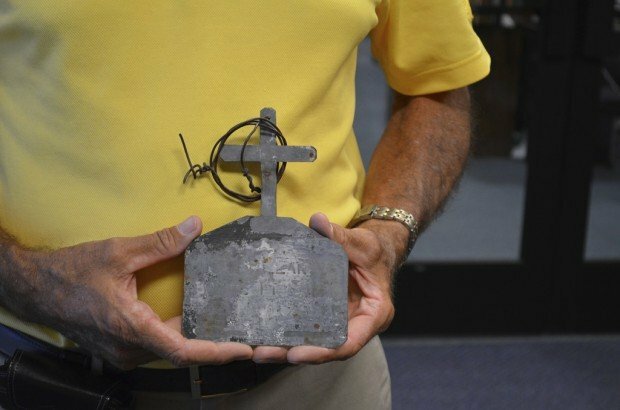 "There was the cross part of the plaque sticking out of the rocks," Gallas said. "I pulled it out and it had wire on it that had been wrapped around the stick of the wooden cross. … I says to my son, 'I think this is that plaque.' I wasn't looking for the artifact at all. I was looking for the site." Gallas wanted to get the plaque into the right hands. It wouldn't be long before he had the opportunity. The men climbed a steep incline back to Temporal Gulch Trail, then headed in the direction of home. "Twenty yards down the trail we run into a group of hikers," Gallas said. He suddenly remembered that Coltrin still led hikers to the spot, so he asked, " 'Are one of you named Ralph?' " Moments later, he was face to face with Ralph Coltrin Jr.
Gallas brought out the marker. "He immediately said, 'This is Michael LaNoue's plaque,' " Gallas said. "He was shaking." "It was quite emotional for me," Coltrin said. "It was like this kid wanted to be found again," Gallas said. "And his friend is at the top of the trail when I get there. ... I feel so honored to be a small part of the legend of this area. Like the final mystery." Wet weather is greening the 2003 Aspen Fire burn area along the Marshall Gulch Trail on Mt. Lemmon.